Last September I received the Carmindy & Co 5 Minute Face kit for my birthday. I’ve always been a huge fan of Carmindy’s on What Not to Wear, so I was hoping I would fall in love with her products. And for the most part, I do. 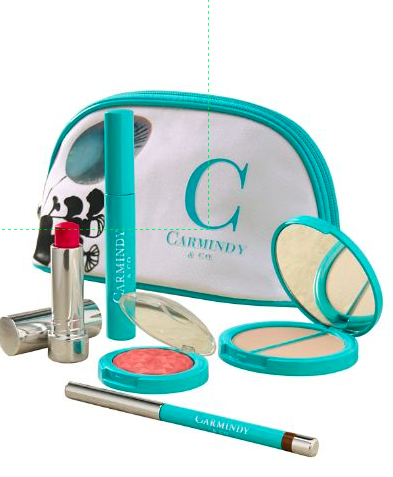 The kit comes with 5 beauty products, plus the adorable bag – all in a gorgeous tiffany blue color. The packaging is fantastic and I love the cosmetics bag. One of the best items is the elevating mascara in black. It isn’t anything overly special, but it is one of the items I use most often. And is perfect for day to day use. The item I use ALL the time is the love struck blush in Universal Pink. I literally use this everyday, and the color mixes and blends beautifully. I can’t recommend this blush enough. The Carmindizing Highlighter is great. One side is powder, the other is cream, and the color matches my pale skin perfectly. I don’t use a highlighter everyday, but this is the one I reach for whenever I want to use one. The Kiss Me Lip Butter in Rose Passion is just ok. It is a coral/red color, and is extremely sheer. More of a balm consistency. Perfect to run errands with, but not so great for work or for going out with friends. It isn’t that pigmented, so I find it similar to chapstick consistency. I’m a lip gloss kind of gal. The product I don’t like at all is the Ever After Eyeliner in Espresso. It isn’t dark, rubs off easily, and I can’t stand the brown color. I love dark, black eye liner, so this naturally doesn’t fit my routine. If you use brown eyeliner though, you might really like it for a soft look! Overall I love the brand. This kit is sold out at HSN, but I believe you can buy the products separately if you want. I know she has many other products in her line, and I can’t wait to try other products from Carmindy!